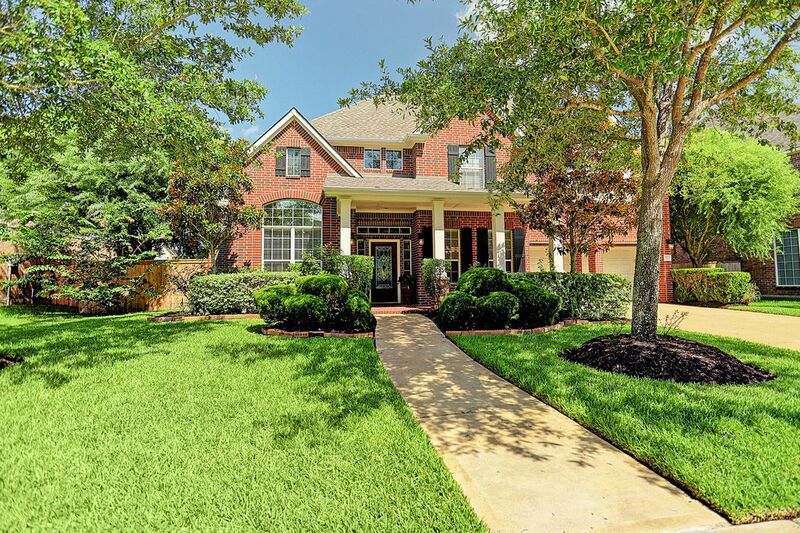 11803 Oakshield Lane, Cypress, TX 77433 | Martha Turner Sotheby's International Realty, Inc. 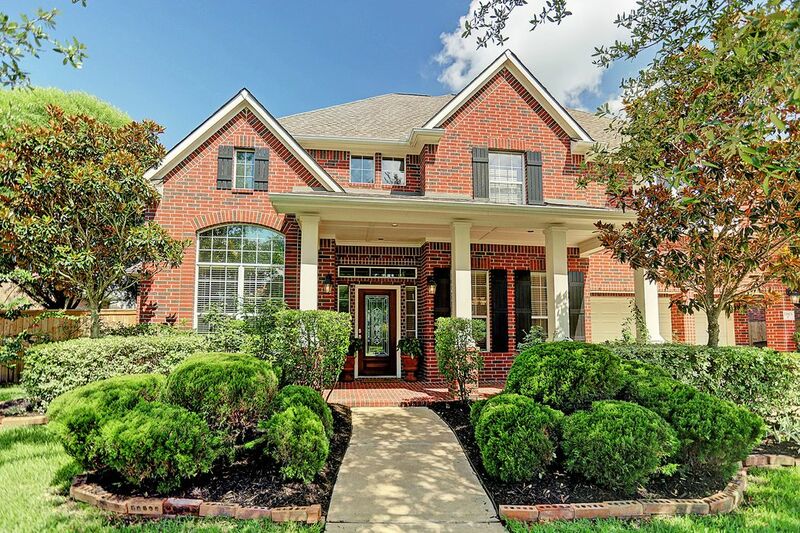 Established landscaping and mature trees add to the charming curb appeal of this stately 4-bedroom home in the golf course community of Blackhorse Ranch. Welcome guests under the shaded cover of the large front porch. 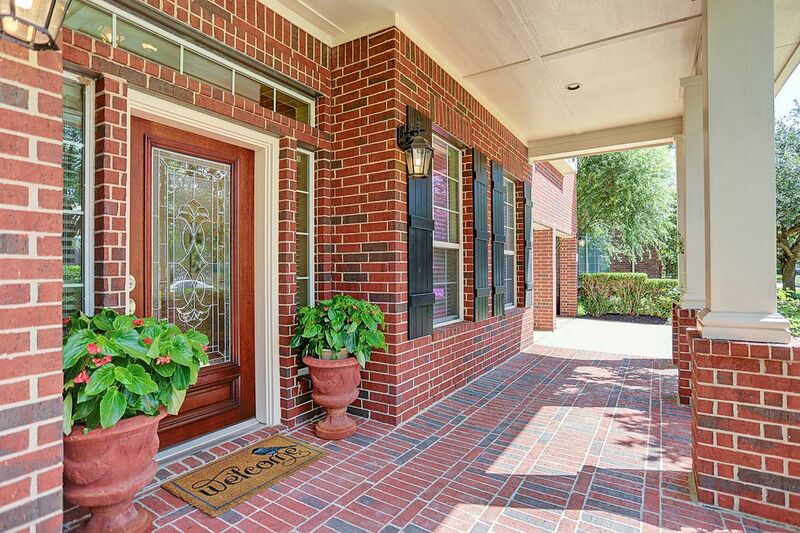 This large front porch has plenty of room for a seating area and provides a clean dry path directly to the driveway. 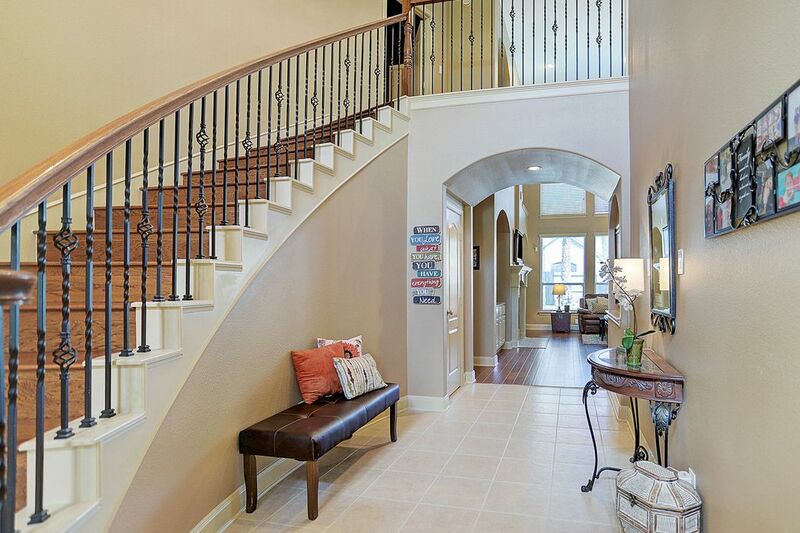 This elegant entry boasts soaring ceiling heights and a lovely curved staircase. 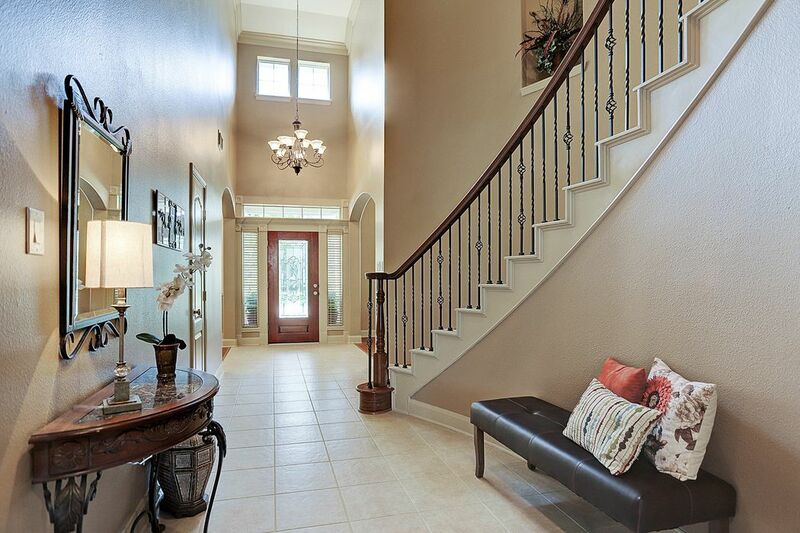 New wood stair treads make this stairway a beautiful focal point upon entering the home. 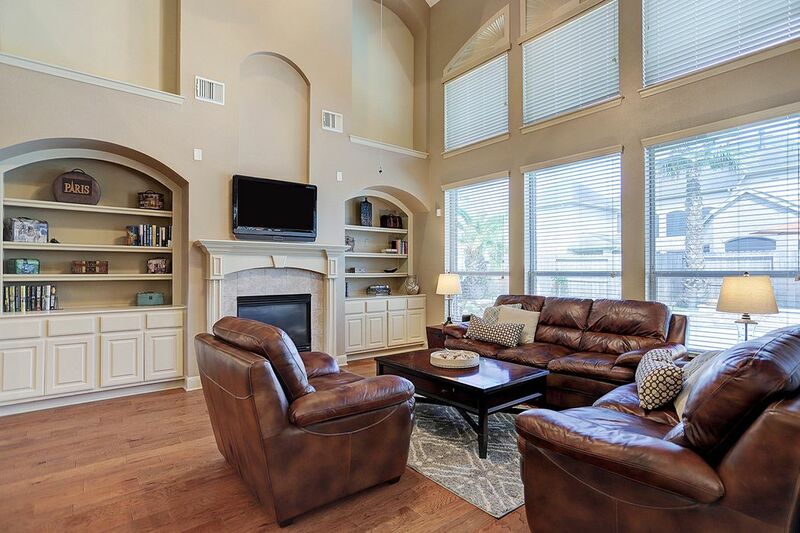 The arched walkway opens up into the large family room with the same vaulted ceiling height. 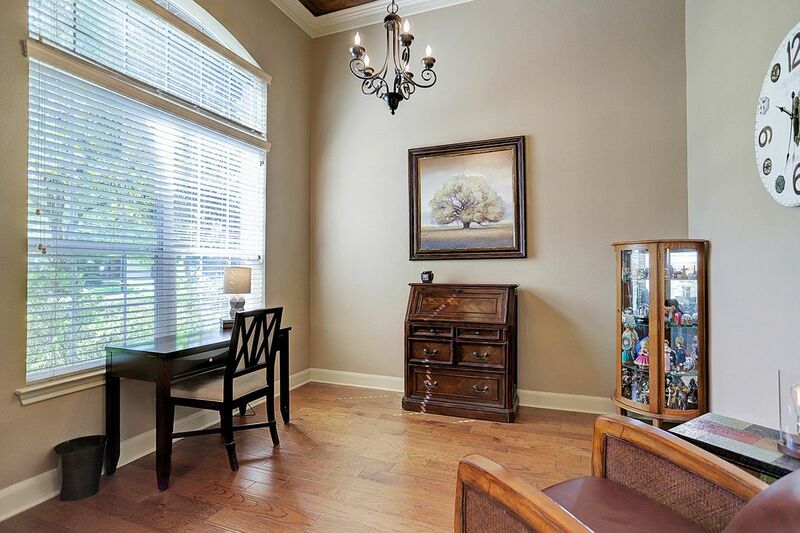 Just off the main foyer, this formal sitting room works perfectly for a quiet place to read or catch up on work. 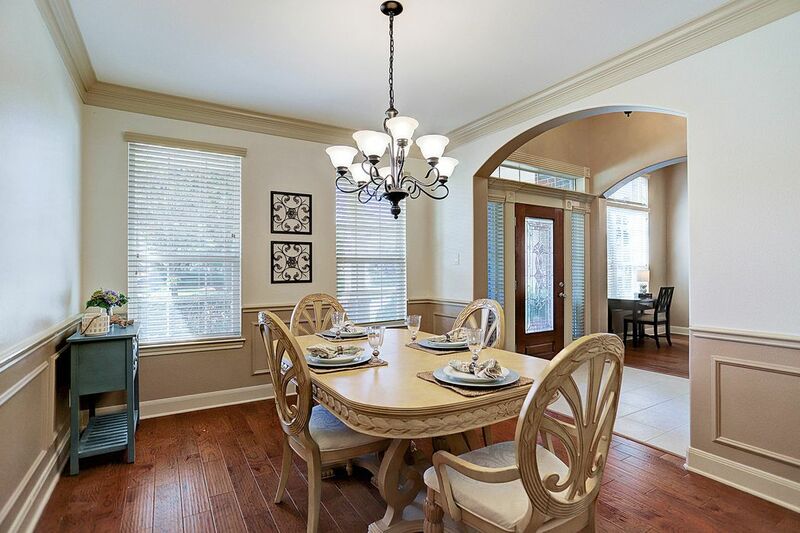 The glow from the scrolled chandelier and new wood flooring make it warm and inviting. Opposite the formal sitting room, this formal dining space has plenty of room to host your most impressive dinner parties. 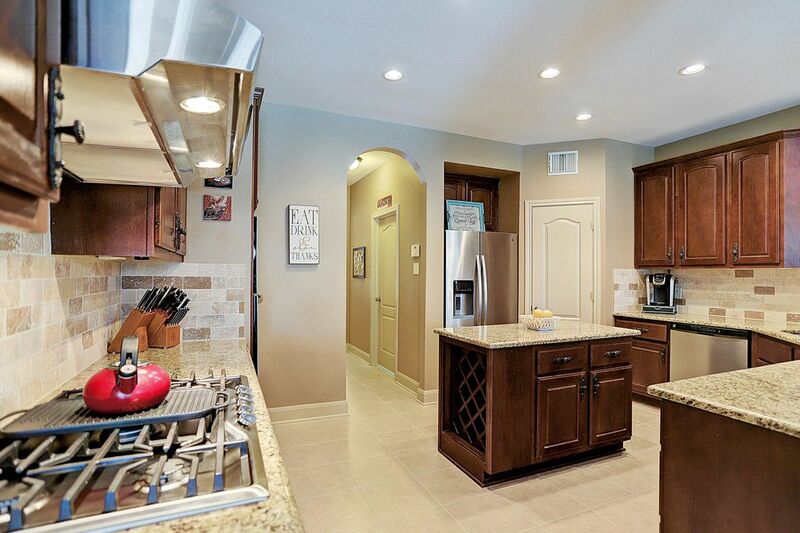 Convenient access to the kitchen via the arched pass-through makes it easy to bring your best recipes to the table. 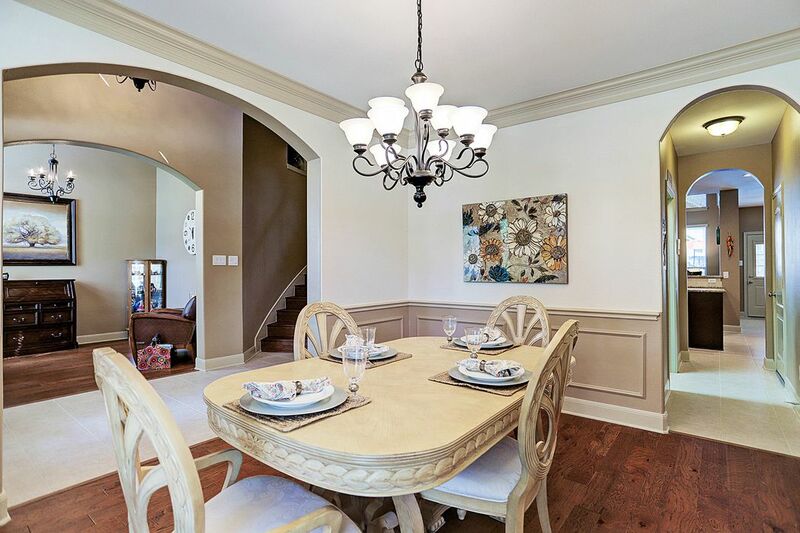 The two-tone paint scheme highlights the chair rail and picture frame molding that accents this dining space. Floor-to-ceiling windows flood this spacious living room with natural light and overlook the beautifully-landscaped back yard. 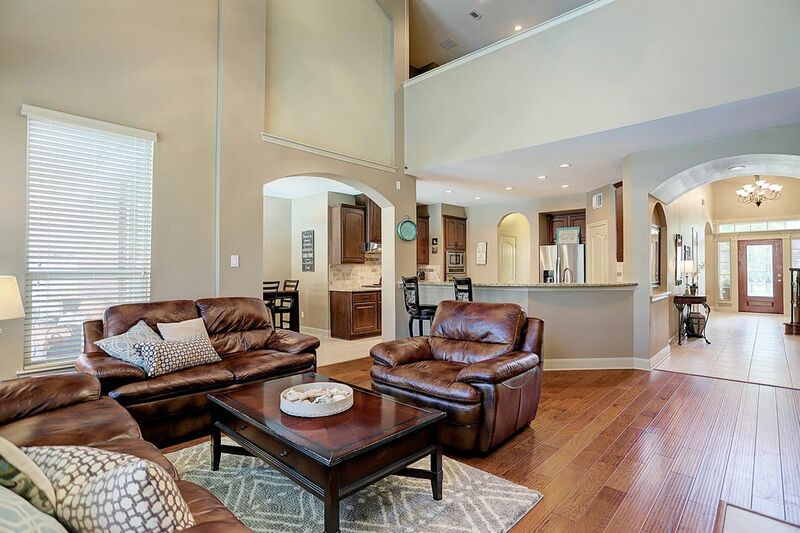 The vaulted ceiling adds to the open feel of the central room of this home. Elegant built-in niches with adjustable shelving flank the cast-stone fireplace ignited by the click of a remote. Looking back toward the entry from the living room, the open, easy flow of this home is evident. 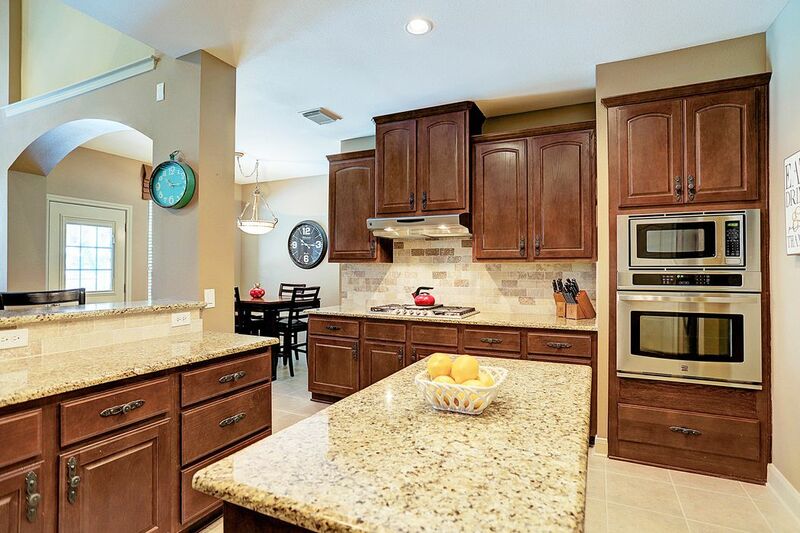 Granite countertops, new stainless steel Kenmore appliances and a large center island make this chef's kitchen complete. The neutral stone backsplash and custom hardware add an elevated rustic charm. Long runs of upper and lower cabinetry provides ample storage for all your kitchen implements. The large eat-in bar opens to the living room to keep sight lines free flowing. Looking back across the kitchen the large walk-in pantry is visible as is the pass through to the formal dining area. The new stainless steel refrigerator will convey. 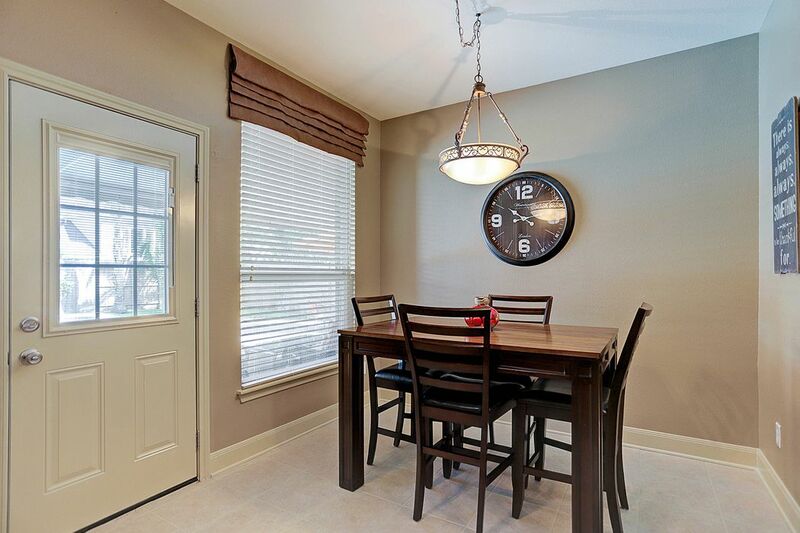 This cozy breakfast nook, located just off the kitchen and main living room spaces, overlooks the backyard. 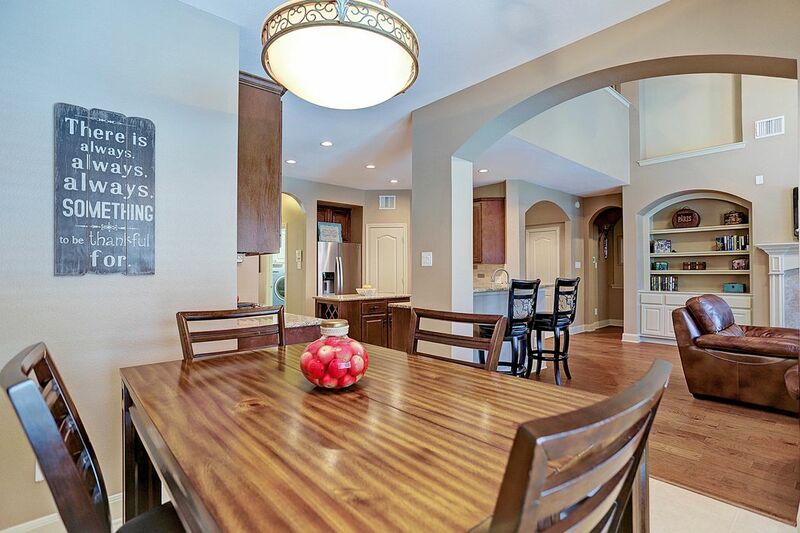 This view looks back from the breakfast nook toward the kitchen and main living areas. 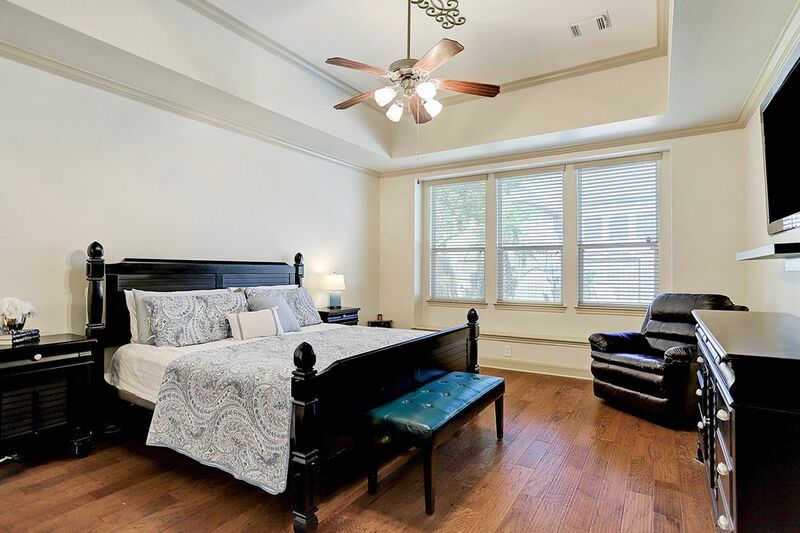 Located on the first floor, this master bedroom is spacious, but distinct, with warm wooden floors and a lovely cove ceiling. Another view of the master bedroom with a glimpse through the double doors leading to the en suite master bath. 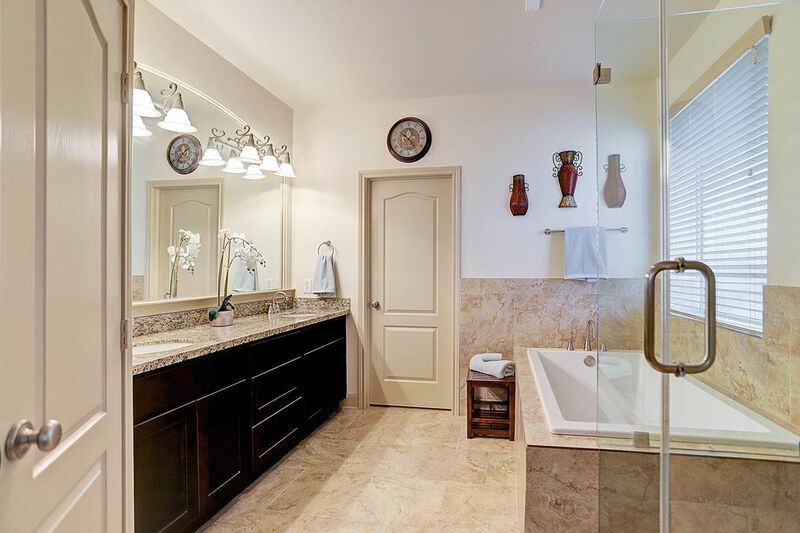 This recent remodel of the master bathroom updates the space with a seamless glass shower enclosure, large soaker tub, granite counter tops and dual vanities. 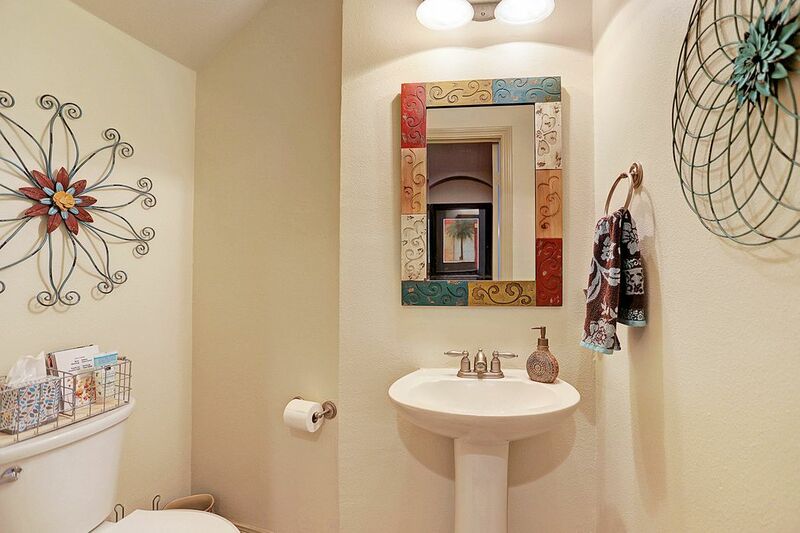 This alternate view of the master bath shows off the custom tile work in the shower and the depth of the soaker tub. 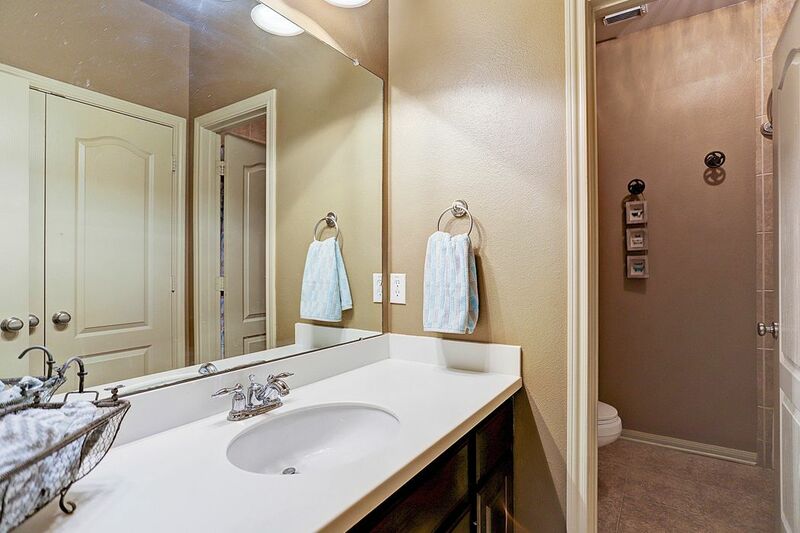 Guest will appreciate this light and bright powder room located just off the main living area. This oversized landing at the top of the staircase is wide enough to be utilized as a flex space. 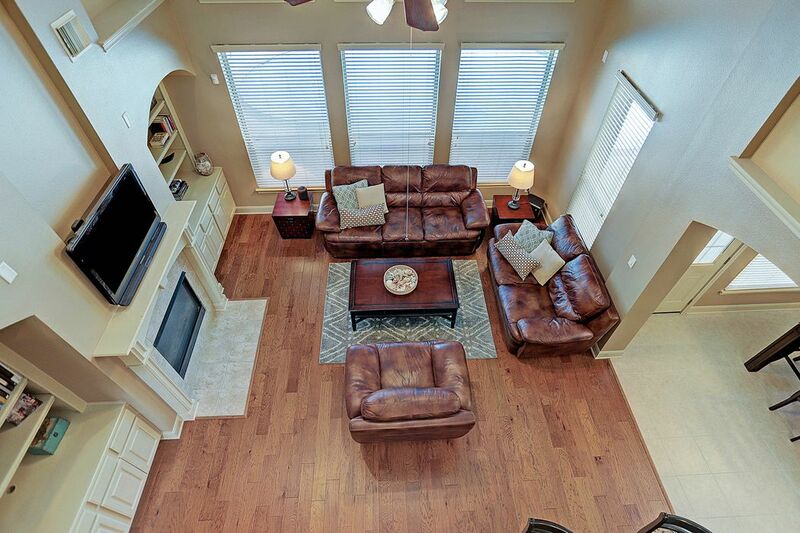 Looking down from the second floor landing, this bird's eye view shows off the roominess of the main living space. 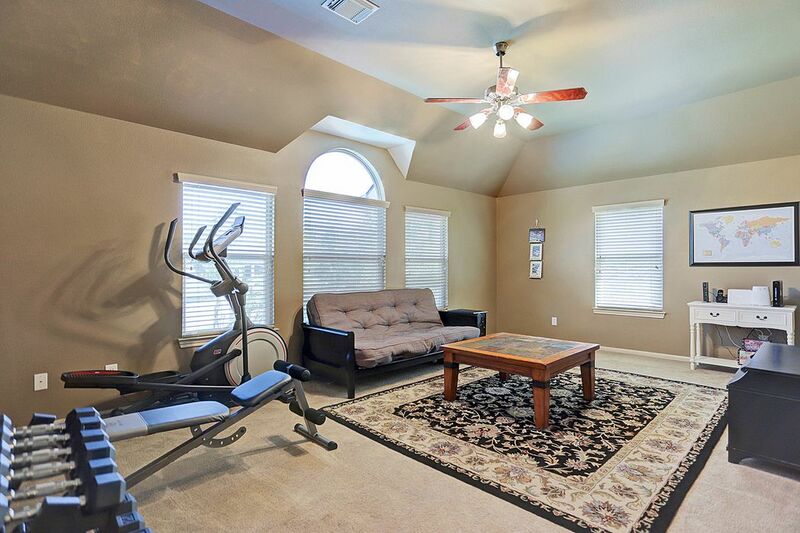 This second-floor game room is large enough to house a full size pool table, create a home gym, or set up a playroom for the kids. This media room will be a family favorite for video games, movie nights or listing to music on the surround sound system. 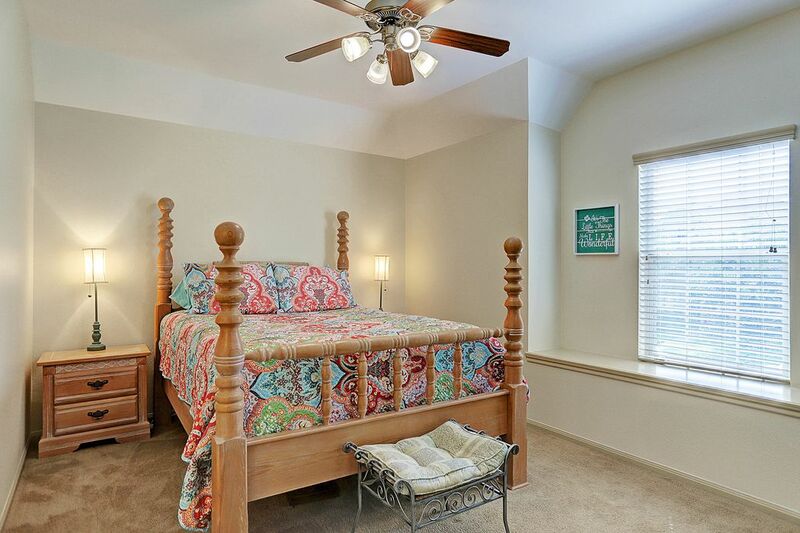 One of three bedrooms located on the second floor. 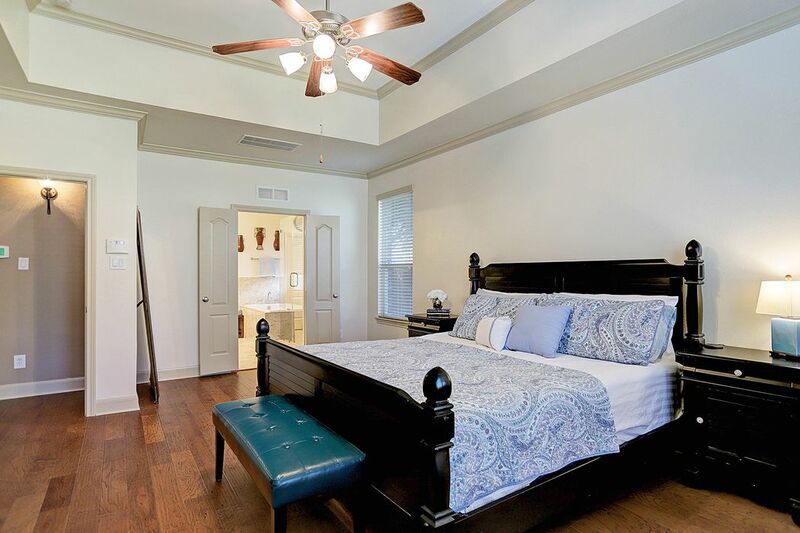 Two of the three upstairs bedrooms are connected by convenient Jack-and-Jill bathrooms. One of three upstairs bedrooms. 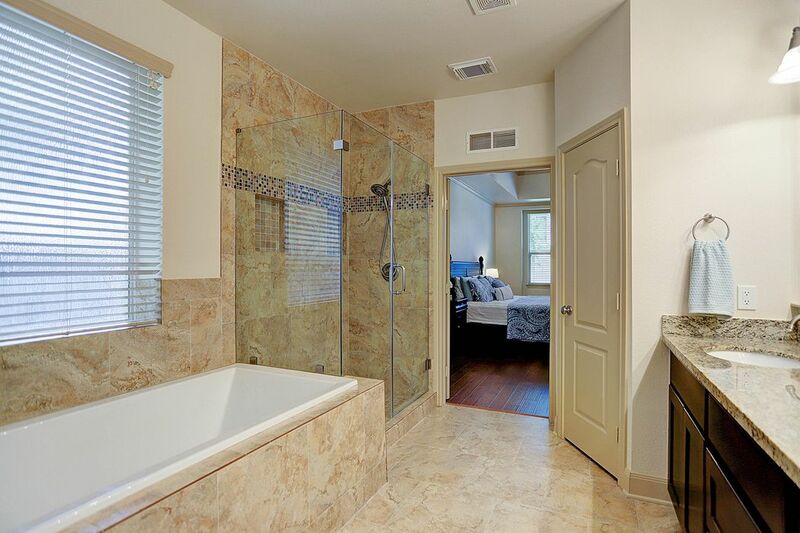 This second-floor full bath is complete with tub/shower combo and roomy linen closet. 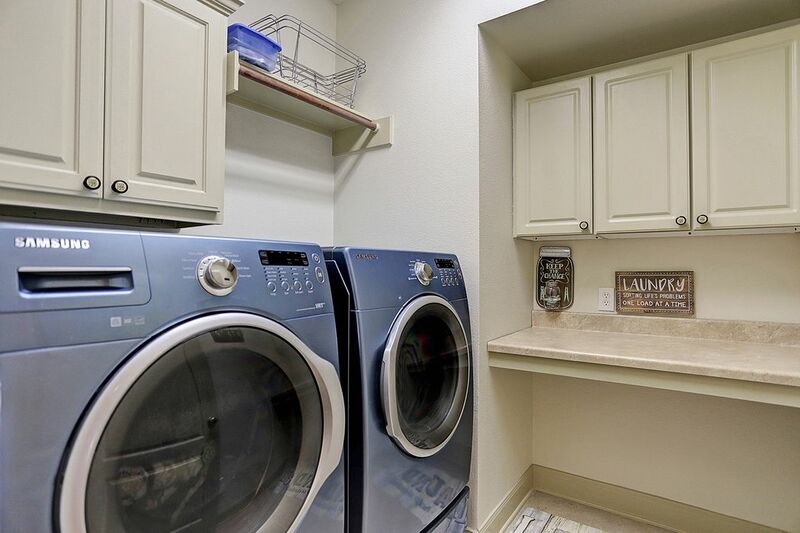 Located on the first floor, this laundry room has a built-in folding table, cabinetry and hanging rod for drying delicates. Step out the back door and enjoy shade at the touch of a button under this retractable awning installed in 2016. A look out from under the awning at the beautifully landscaped backyard at the heated saline pool and spa. A complete re-plaster of the pool was completed in 2016. A new pump and heater were installed in 2018. 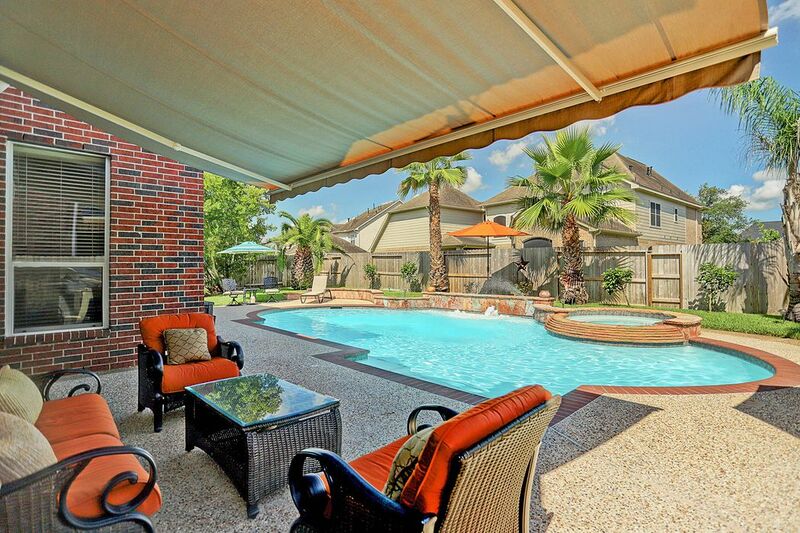 Relief from the Texas heat just steps outside your own back door. 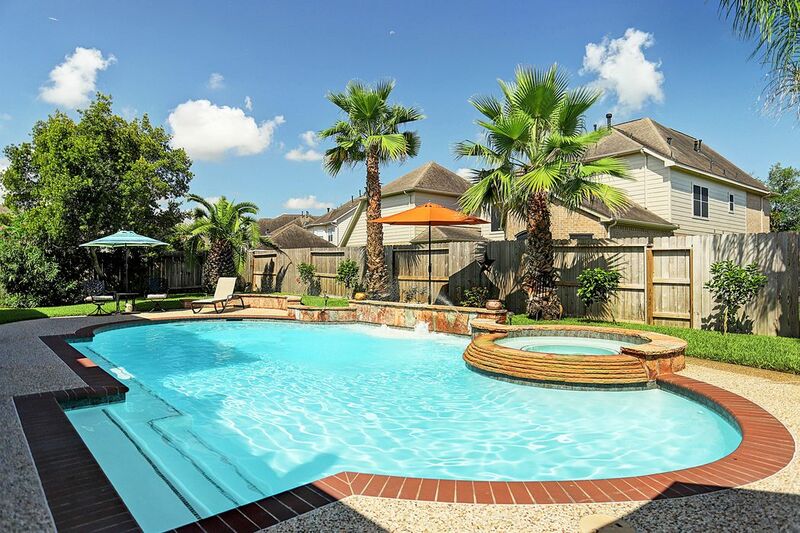 Well maintained and complete with fun water features, this saline pool is perfect for hosting swim parties or just a peaceful solo float. 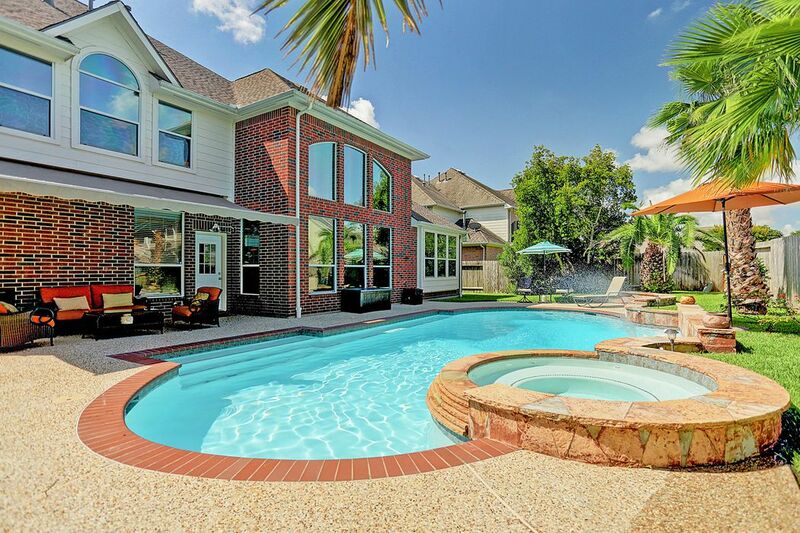 A perfect space for entertaining or enjoy evenings relaxing in the hot tub. Accented with a beautiful flagstone wall, the various seating areas provide choices for warming in the sun or watching from a shady spot. With two thirds of the backyard fencing recently replaced, everything is in place and ready for summer fun! 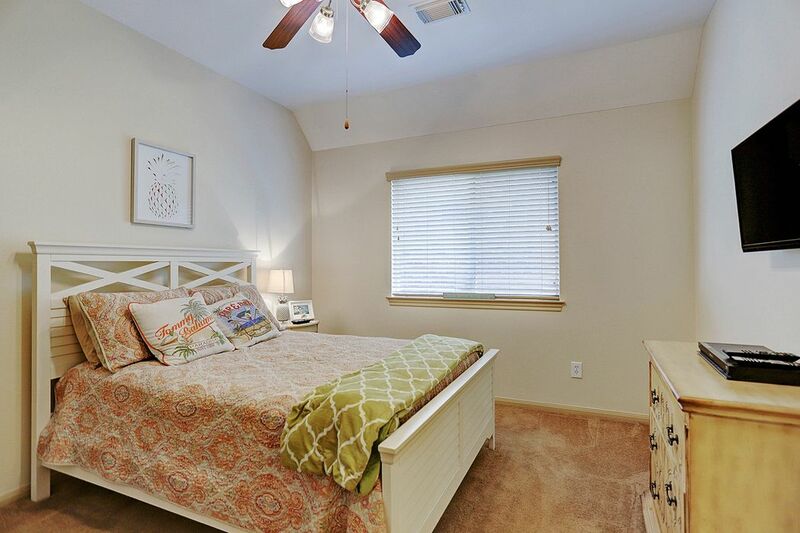 $400,000 4 Bedrooms3 Full / 1 Partial Baths3,736 sq. ft. 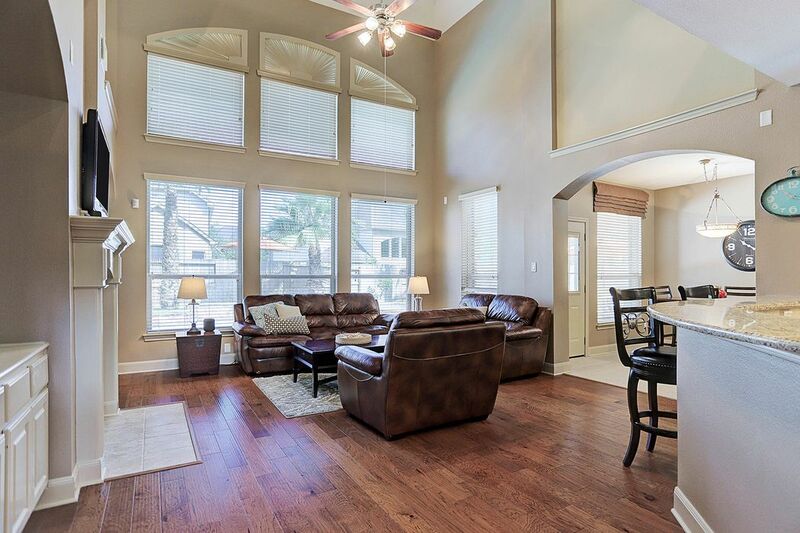 Spacious 2-story, 4-bed, 3.5-bath Coventry built home in sought-after golf course community of Blackhorse Ranch with heated pool and spa. 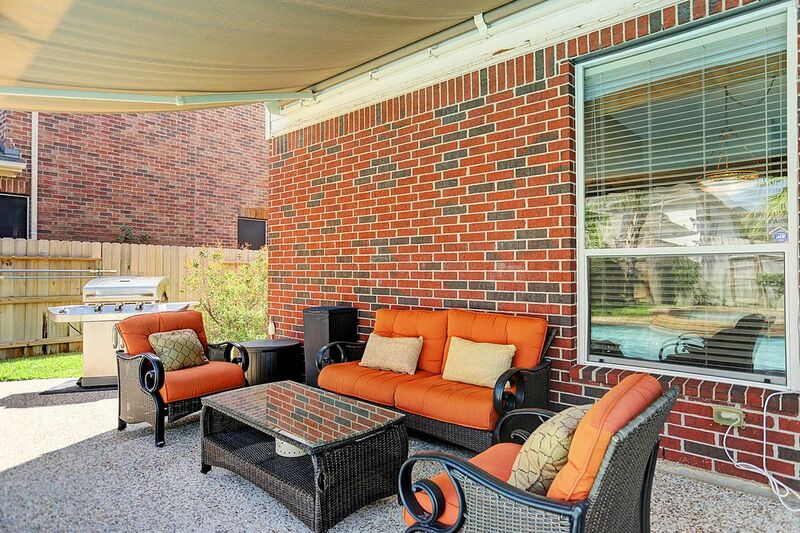 This home has lovely curb appeal with a large covered porch with extra seating offering an inviting space to relax. 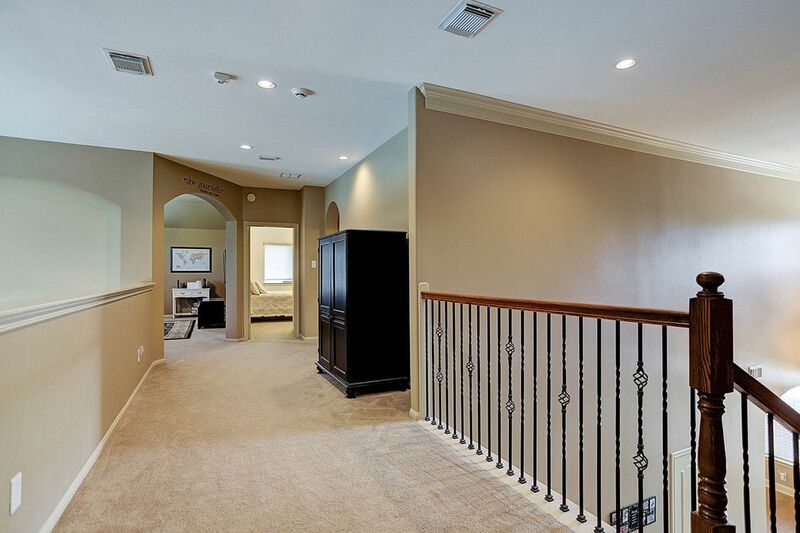 Enter into the home under soaring ceiling heights with a vaulted entry and an elegantly-curved staircase. 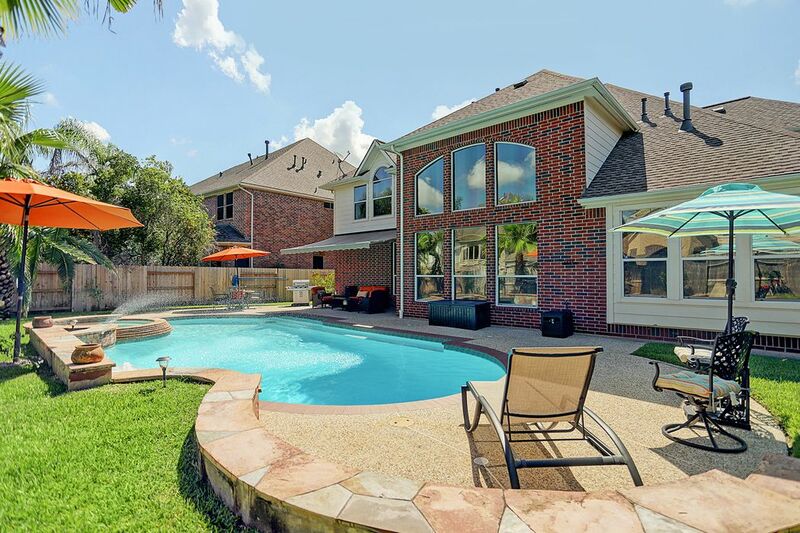 Embodying an open floor plan, floor-to-ceiling windows adorn the main living space and give a full view overlooking the lush backyard entertaining space. 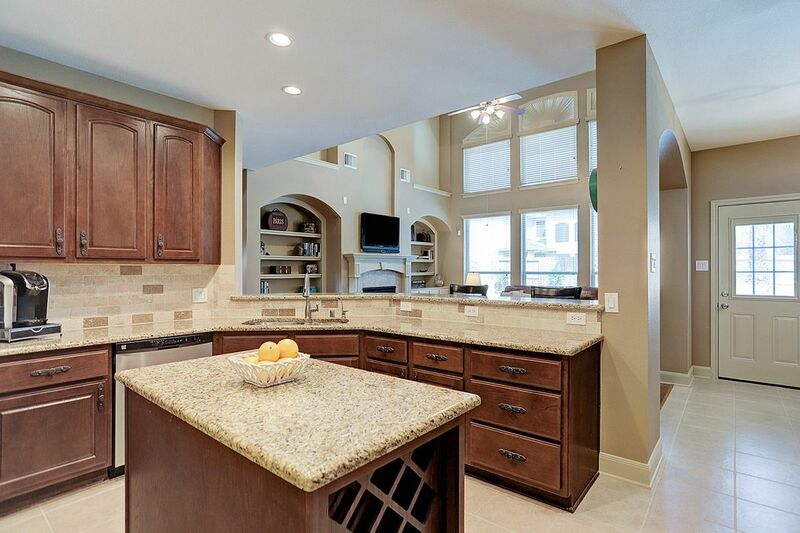 A cook's kitchen boasts granite countertops, new stone backsplash, new stainless steel Kenmore appliances and a large center island accented at one end with a decorative wine rack. New hardwood flooring has been installed in the main living, staircase, formal living and dining, and master bedroom. A complete remodel of the master bath in 2016 includes seamless glass shower, custom tile work, new soaker tub and dual vanities with granite counters. 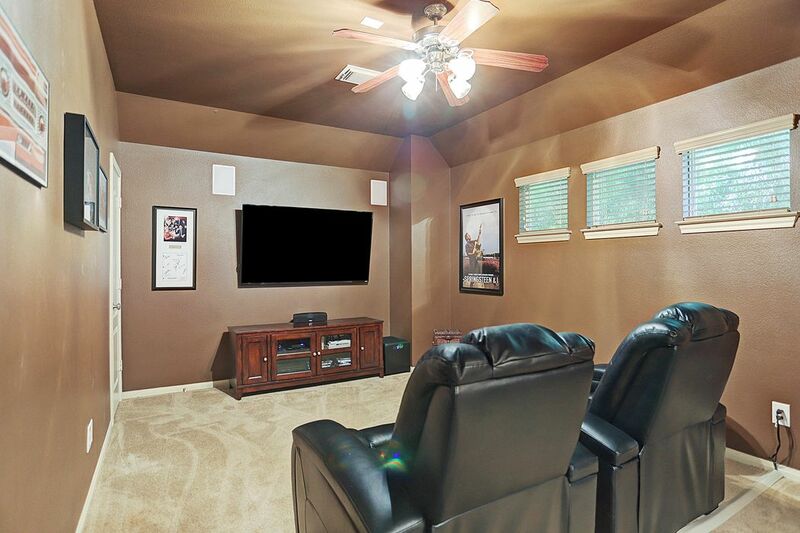 A second-floor game room plus separate media room ensure plenty of room for entertaining and relaxing. 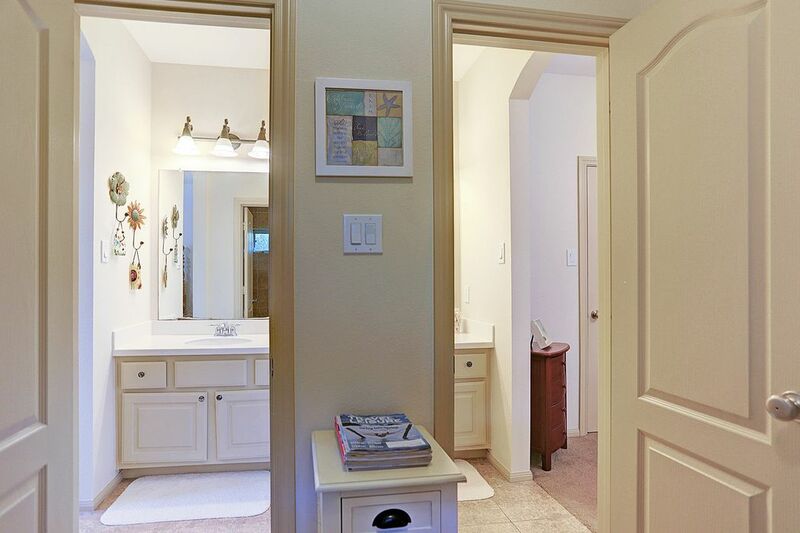 A Jack-and-Jill bathroom connects 2 of the 3 upstairs bedrooms. Additional updates include a new roof (2018), remote-controlled retractable awning and complete pool re-plaster in 2017; and two new AC units, pool pump and heater in 2018. Lower taxes compared to neighboring communities and zoned to Cy-Fair ISD schools.